Wizard Dojo – Page 108 – A wizard is never late, nor is he early. He reviews stuff precisely when he means to. When Pocahontas was released in 1995, it proved to be something of a turning point for the Disney Renaissance era. 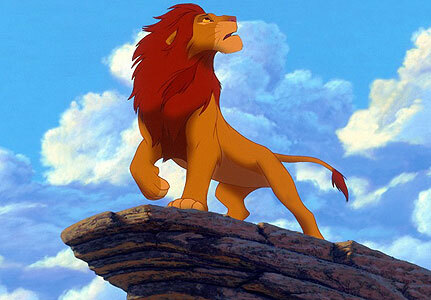 While Disney gave themselves a huge pat on the back for making their first film inspired by historical figures and events, it ended up being something of a black sheep to audiences and critics, who found it disappointing compared to its predecessors. Today, Disney seems to market the Pocahontas character more than the film itself, a possible sign that the film has even fallen out of favor with Disney themselves. Although many of the critiques are justified, Pocahontas is a better movie than it gets credit for. Disney’s interpretation of Pocahontas sees the film’s namesake heroine (Irene Bedard), a young Powhatan “princess” who crosses paths with Englishman John Smith (Mel Gibson), as the English make their way into the new world. Pocahontas and Smith form a friendship, and later romance, that leads Smith to reevaluate his beliefs of the native people. Meanwhile, tension between the Powhatans and the English is brewing, as the conniving Governor Ratcliffe (David Ogden Stiers) – who is leading the English expedition – plans to ravage the new world of its riches by any means necessary. Much has been said about the historical inaccuracies of the film (though the presence of a magic, talking tree probably indicates Disney wasn’t aiming for accuracy), but when taken for its own merits, it’s actually a pretty solid story, if maybe not a groundbreaking one. Pocahontas herself, while maybe not the most unique heroine in terms of personality, is at least a strong enough main character to carry the story. 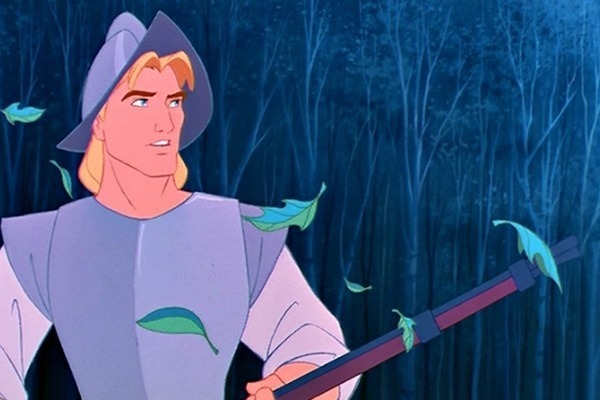 John Smith is similarly unremarkable in personality, falling into Disney’s usual ‘Mr. Perfect’ archetype. But at least he learns a lesson or two before fully surrendering to the trope. Ratcliffe is a fun, though terribly underutilized villain. 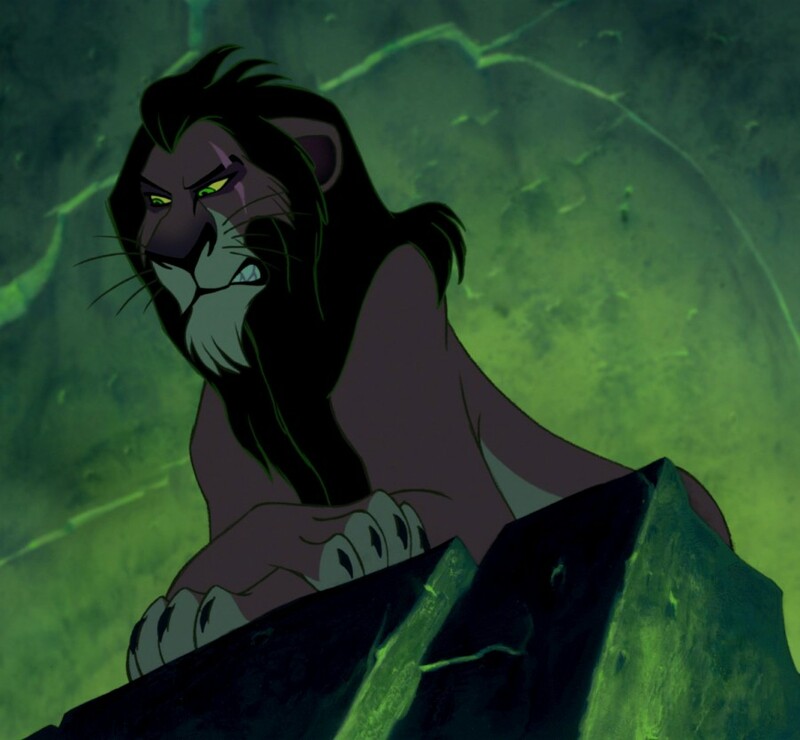 He has a little more purpose for his evil deeds than most Disney villains (he’s described as a “failed social climber,” with his current expedition being his last chance to prove his qualities), but he never gets much time to interact with the heroes. It almost feels like Ratcliffe is part of a sidestory of the film, instead of its primary antagonist. True to the Disney form, a group of comedic sidekicks are involved, to add a little more humor and personality to the film. 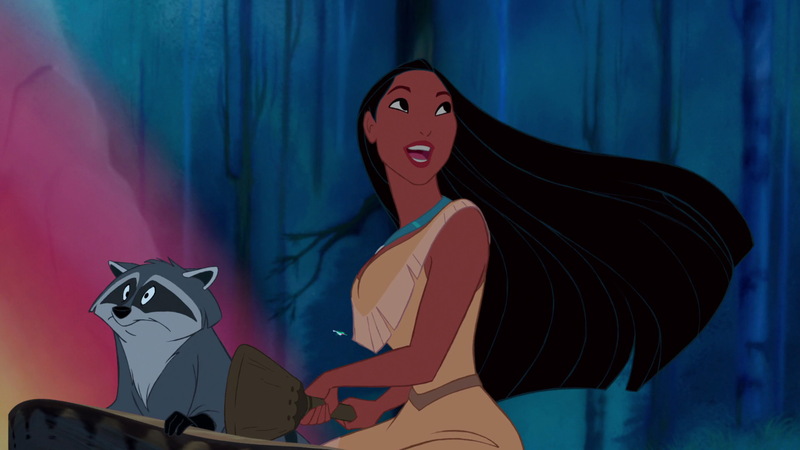 Pocahontas is often joined by a raccoon named Miko and a hummingbird named Flit who, along with Ratcliffe’s dog Percy, provide some fun, cartoonish antics. But it’s Ratcliffe’s naive and well-meaning manservant Wiggins (also voiced by Stiers) who is probably the film’s funniest aspect. The soundtrack to Pocahontas is probably the one piece of the film that even its harshest critics can appreciate to some degree. 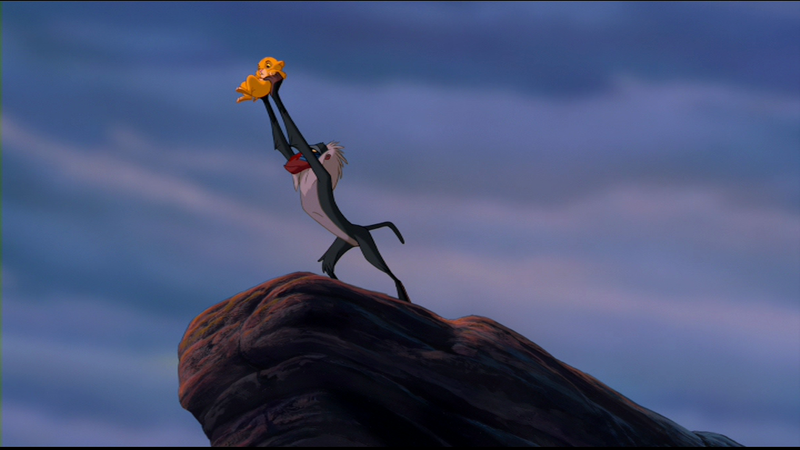 I would argue that the film’s centerpiece number “Colors of the Wind” is better than any one song from The Lion King, as it sums up the film’s message in one beautiful musical piece. “Just Around the River Bend” isn’t quite as good, but nonetheless catchy. “Mine, Mine, Mine” serves as Ratcliffe’s obligatory villain song, and it’s actually a pretty fun one, until John Smith strangely gets a verse in it and it loses some of its villainous charm. “Savages” serves as the film’s climactic musical number, and is effectively frightening in its lyrics. The animation is another highlight. 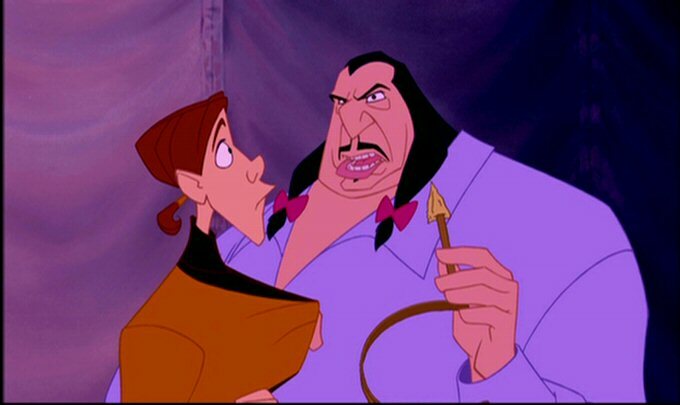 The characters in Pocahontas were animated to look a little more realistic than the other Disney film’s of the 90s (with the exceptions of the sidekicks and Ratcliffe, who retain a more cartoonish look to magnify their roles in the story). 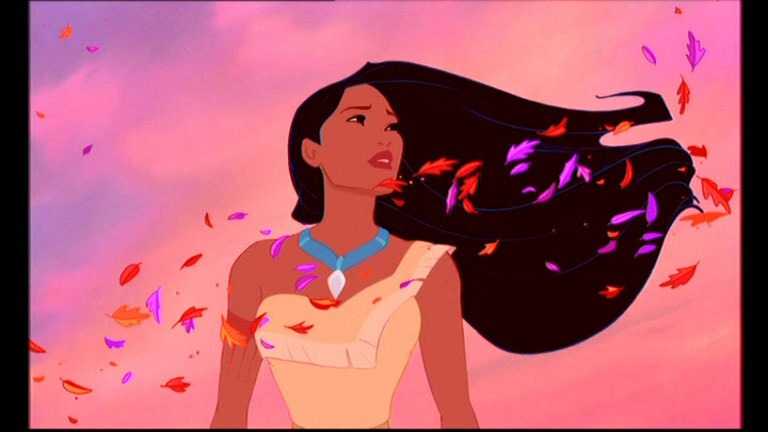 The characters have detailed facial expressions and a richness in their movements that give Pocahontas a distinct animation style among Disney films. It’s all the more eye-popping during the musical numbers (Colors of the Wind adopts a painting visual style, while Savages utilizes aggressive color schemes). Despite the visual and musical heights, Pocahontas still has a few bumps in its story. Some elements, such as Pocahontas magically learning to speak English by “listening to her heart,” are a bit too convenient. The overall message, while certainly well intentioned, can be a little too loud for its own good. 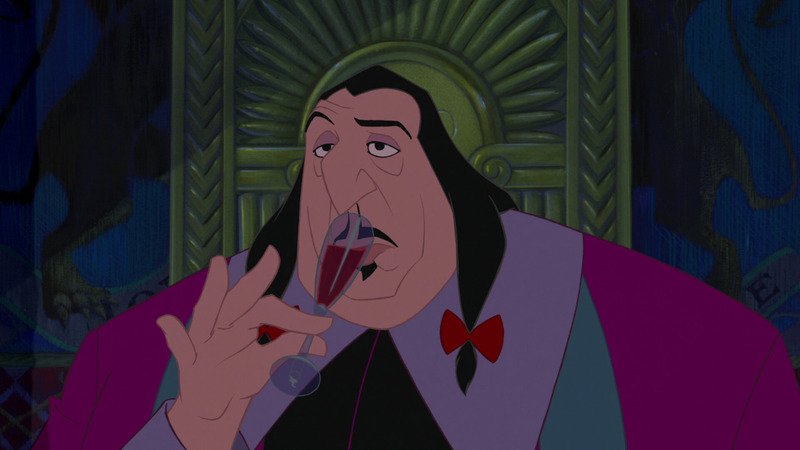 And as previously stated, Pocahontas and John Smith aren’t particularly interesting, and Ratcliffe, while a fun villain, could have used more screen time. Pocahontas may not quite live up to its revered siblings of the Disney Renaissance, but it still provides a good piece of Disney entertainment brought to life through lovely animation and songs. When Aladdin was released in 1992, it arrived at the height of the Disney Renaissance. 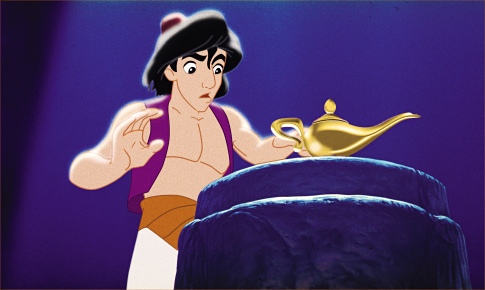 Coming off the heels of Beauty and the Beast, Aladdin was, for a time, the most successful animated film ever. It remains one of Disney’s most popular movies. But while Aladdin may have introduced audiences to one of Disney’s best characters, I’m afraid time has revealed the movie to be a bit of a one trick pony. Aladdin sees its titular hero (Scott Weinger), a peasant of the streets of Agrabah, cross paths with Princess Jasmine (Linda Larkin), who has fled the palace for the day to avoid any more pompous suitors. Before their romance can blossom, they are separated by the forces of Agrabah’s corrupt Grand Vizier Jafar (Jonathan Freeman). 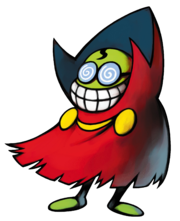 Jafar plans on taking over Agrabah, and seeks the aid of a magic lamp, with which he can summon a powerful genie to grant his wishes. The lamp is located in an ancient chamber known as the Cave of Wonders, which is cursed to all but the “Diamond in the Rough.” It turns out Aladdin is this Diamond in the Rough. Aladdin finds the lamp and, hoping to reunite with Jasmine, frees the Genie (Robin Williams). And that’s when the fun begins. 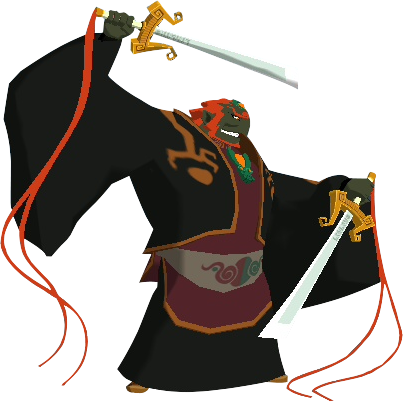 The Genie was a revelation of a character. He’s a non-stop barrage of visual gags and ad-libbed one-liners. Robin Williams’ performance was so full of energy that the animators must have had some trouble trying to create visuals that could keep up with it. But the end results couldn’t have been better. 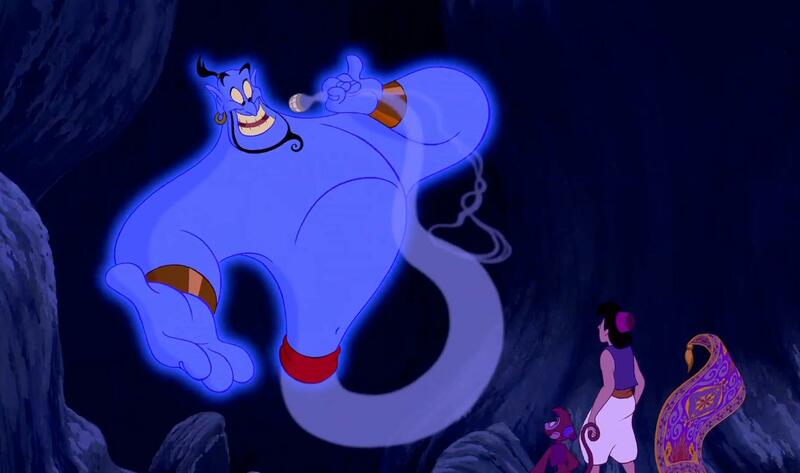 The Genie is still one of Disney’s best characters: his vocal performance is a thing of utter hilarity, and his supernatural qualities (as well as Williams’ improvisations) allowed for the character to break the fourth wall, impersonate celebrities, make references to (and even poke fun of) other Disney films, and provide a visual energy that Disney has rarely matched since. It’s a shame then, that the rest of Aladdin simply can’t keep up. The movie does have good intentions, with a sweet message about being honest and true to yourself (Aladdin uses his first wish to become a prince, only for it to blow up in his face later), and the songs are memorable. But aside from that wonderful Genie, the rest of the characters are a bit bland, the and the story doesn’t match up to some of Disney’s better films. Aladdin himself is a cookie cutter hero. 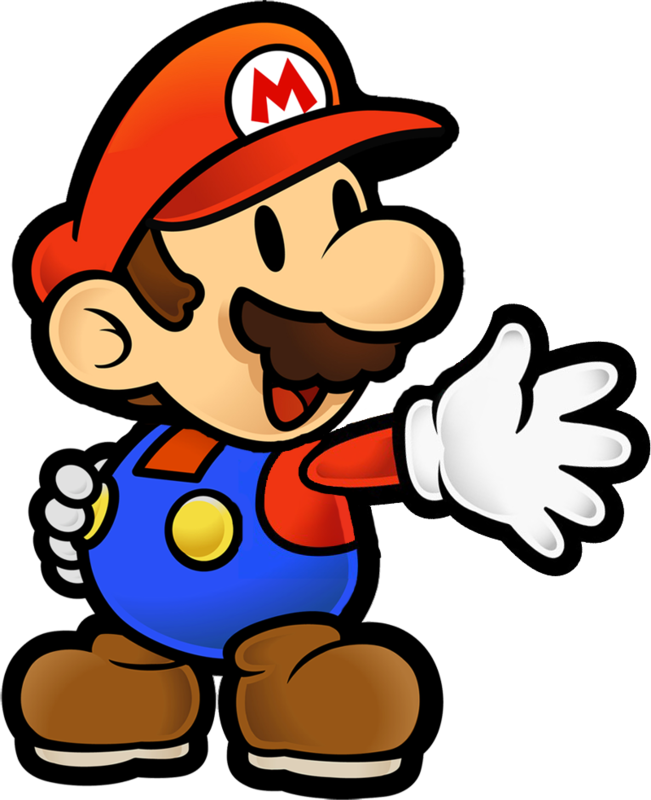 His character lacks any standout traits, and he more or less is just filling out the ‘main character’ position. Jasmine is equally uninteresting. 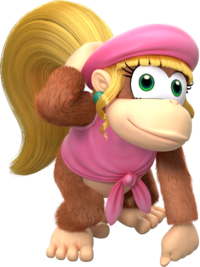 She at least has a more standout character design, but her personality doesn’t differ much from any other princess character. The relationship between the two never comes off as anything more than your standard “poor guy meets rich girl” setup, with the exception of the film’s signature song. Even Jafar, who has since become one of the more iconic Disney villains, can kind of feel like a stand-in villain. He’s just here because the movie needs a bad guy. But about those songs. Aladdin features a pretty great soundtrack, even if it never quite matches up to Little Mermaid or Beauty and the Beast. The previously mentioned signature song, “A Whole New World” is one of Disney’s better duets, and provides a moment of beauty in a film that otherwise relies on the laughs. 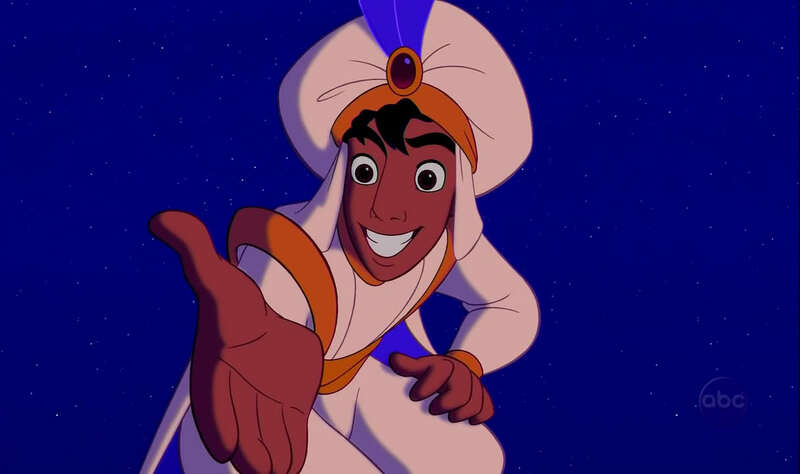 “One Jump Ahead” serves as a basic but catchy introductory song for Aladdin’s character. “Prince Ali” is sung primarily by Williams’ Genie, and is appropriately one of Disney’s liveliest songs. 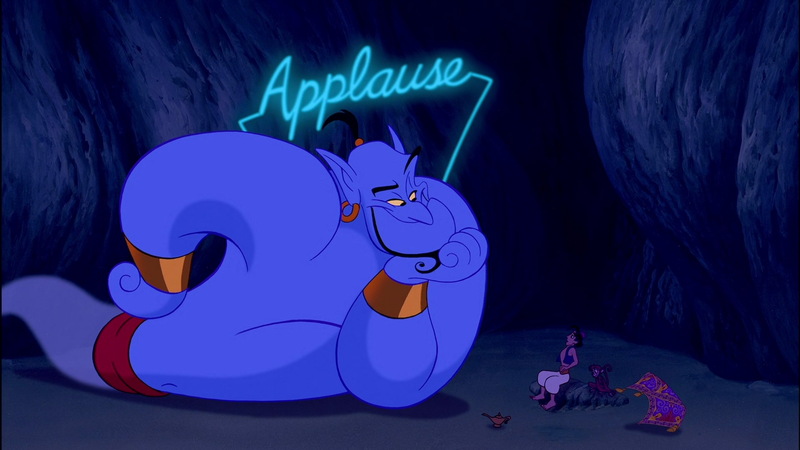 But it’s Genie’s iconic number “Friend Like Me” that truly brings the house down. The movie is also a visual delight, as it well utilizes its Arabian setting to provide an Earthy color scheme, only for things to burst with colors every time Genie’s antics take place. 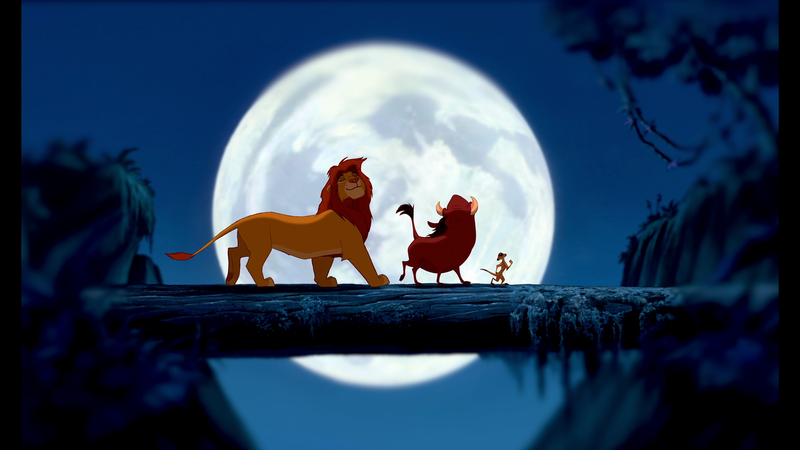 The characters are all well animated, and showcase both Disney’s expertise with the craft as well as their production values. Aladdin is an entertaining movie thanks to the catchy soundtrack and, of course, the irreplaceable Genie, who keep the whole thing afloat. But whenever there’s a break in between songs and Genie isn’t providing the laughs, I’m afraid Aladdin can be more than a little bland. 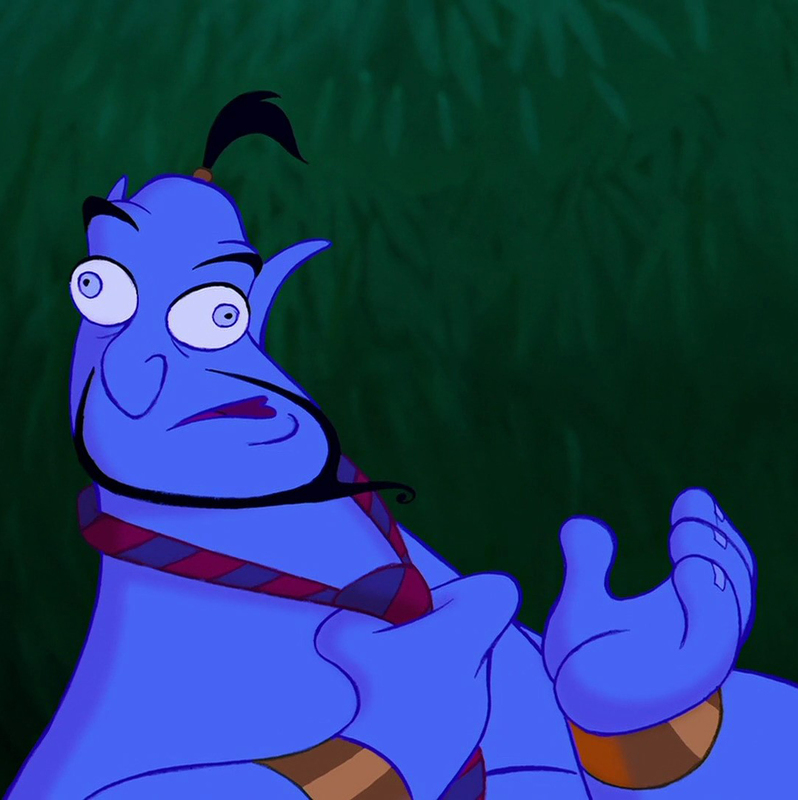 Genie may be one of the Disney brand’s greatest creations, but take him out of the equation and Aladdin would be downright forgettable. Few Disney films are as beloved as Beauty and the Beast. Originally released in 1991, Beauty and the Beast polished the format laid down by The Little Mermaid to its peak, and it is often recognized as the best film from the Disney Renaissance era. In all the years since its release, Beauty and the Beast hasn’t lost a step. It remains one of the studio’s finest achievements. 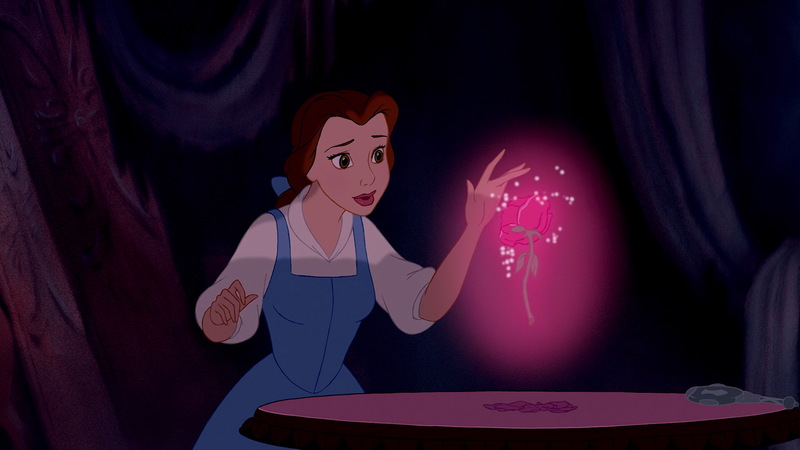 Beauty and the Beast tells the story of Belle (Paige O’Hara), a young woman known throughout the village for her beauty, as well as her “peculiar” behavior (such as her fascination with books and fairy tales). After her father is kidnapped by the titular Beast (Robby Benson), she takes her father’s place as a prisoner in the Beast’s castle in exchange for her father’s freedom. But what starts off as a noble sacrifice becomes the story of romance and transformation. The Beast was not always so beastly, at least not in physical appearance. 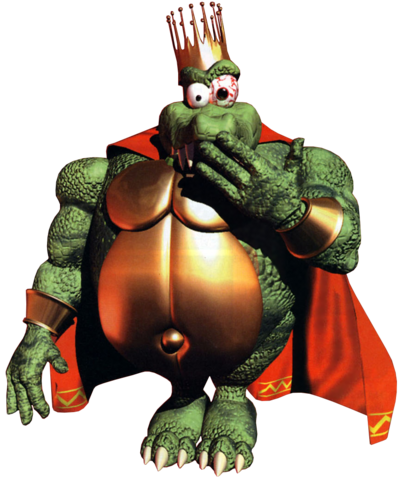 He was once a handsome prince, but he and his castle were cursed by a mysterious enchantress as punishment for the prince’s unkindness. He became the Beast, and the staff of his castle were changed as well (though into more charming forms), the only hope of breaking the curse is for the Beast to learn to love another, and to earn their love in return. It’s one of Disney’s best stories, and one of the few from the studio that emphasizes character as well as plot. The relationship between Belle and the Beast is a far more fleshed out romance than most of those found in Disney features. The movie takes the time to develop the main characters, so the film’s core relationship – despite being a fairy tale romance – feels believable. 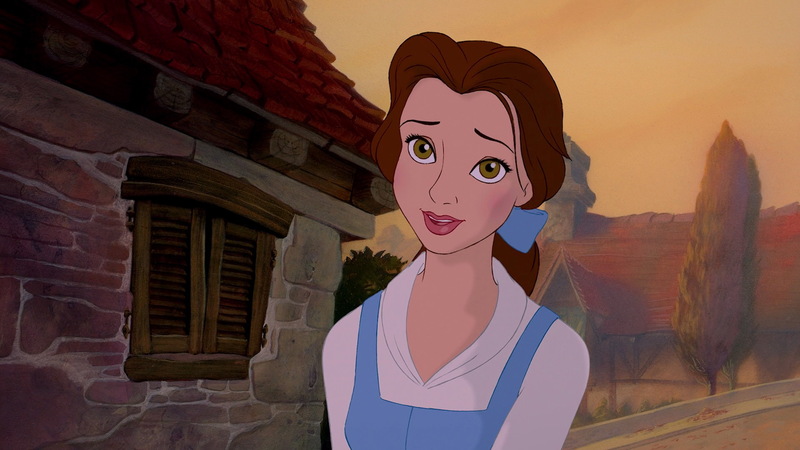 Belle is one of Disney’s stronger heroines, displaying a sense of independence that outshines any of her predecessors, while the Beast is far more interesting than any Prince Charming for being a tormented, and often antagonistic character. They are joined by a parade of some of Disney’s most endearing sidekick characters: Lumiere the candlestick (Jerry Orbach) is romantic and rebellious, Cogsworth the clock (David Ogden Stiers) is pretentious and uptight, and Mrs. Potts the teapot (Angela Lansbury) is kindhearted and nurturing. There’s also Chip (Bradley Pierce) a teacup and Mrs. Potts’ son, as well as Belle’s father Maurice (Rex Everhart), a cooky and eccentric inventor. 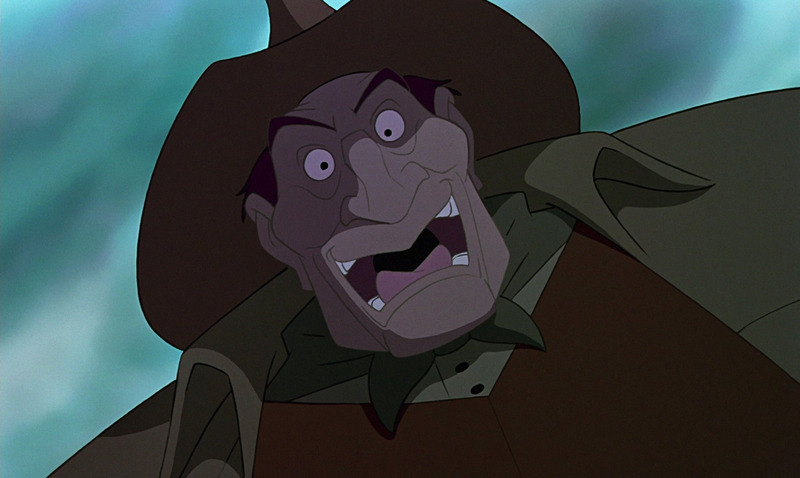 Along with the memorable heroes is an equally memorable villain in Gaston (Richard White), a man from Belle’s village who is beloved by the townspeople for his good looks, despite his ugly personality. 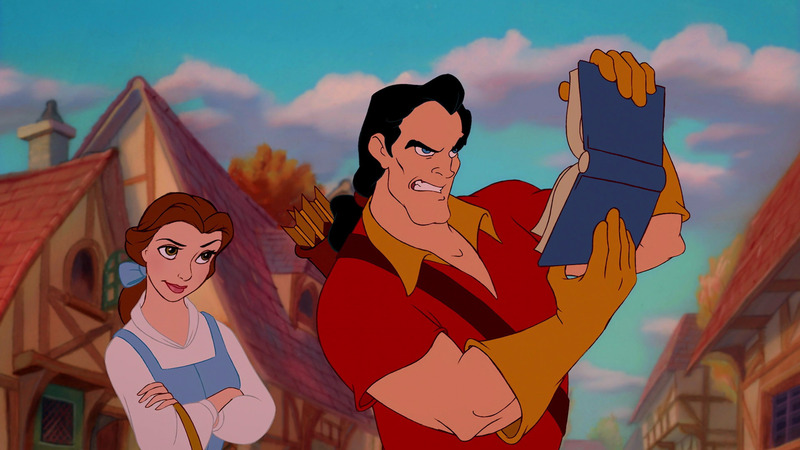 Gaston is one of the more underrated Disney villains, showing a greater range of character than most of the baddies in the Disney canon. Gaston starts off as little more than a buffoonish oaf and a nuisance, trying to win Belle’s hand in marriage simply for her beauty, but by the third act, vanity and jealousy turn him into a monster. 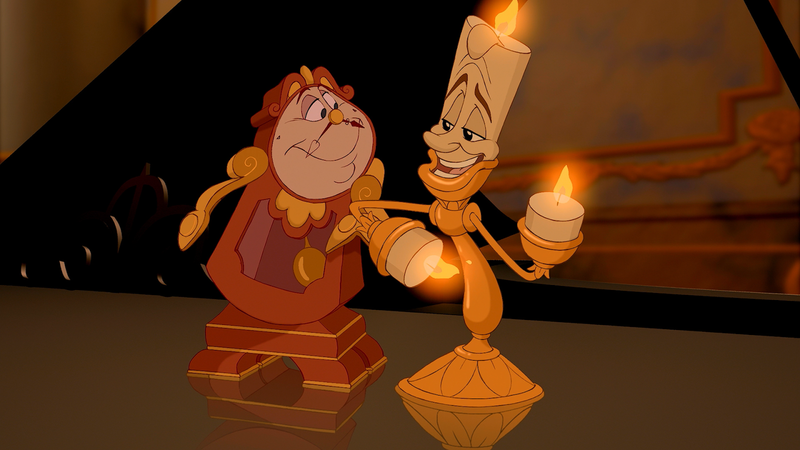 Beauty and the Beast boasts one of Disney’s best casts of characters. The main characters having a bit more to them than most Disney heroes, the sidekicks are all funny and charming (not to mention they actually have an integral role in the plot, and are never distracting from it), and its villain proves to be just as entertaining. 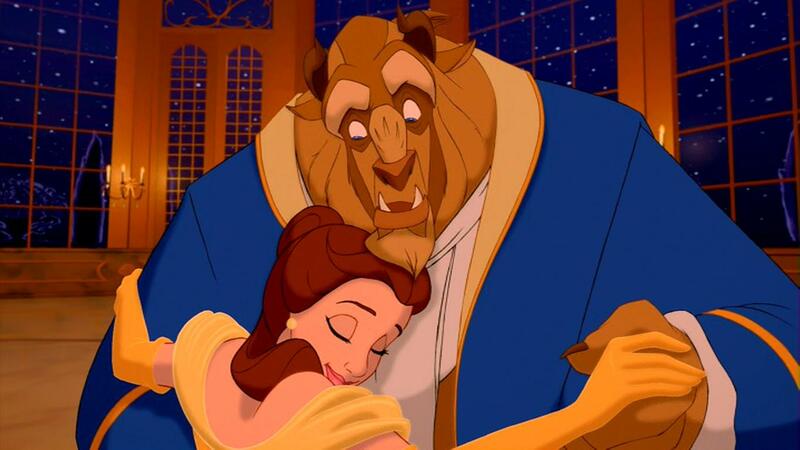 Of course, it’s the songs that bring out the best of Beauty and the Beast’s story and characters. The soundtrack to Beauty and the Beast has long-since become iconic. Its self-titled theme song – sung by Angela Lansbury’s Mrs. Potts – being hauntingly beautiful. “Be Our Guest” is among the most fun and smile-inducing Disney songs. “Belle” serves as one of the best ‘introductory songs’ in the studio’s history. And few Disney songs come close to the hilarity of “Gaston,” in which its titular villain and his sycophants sing of his manly accomplishments. 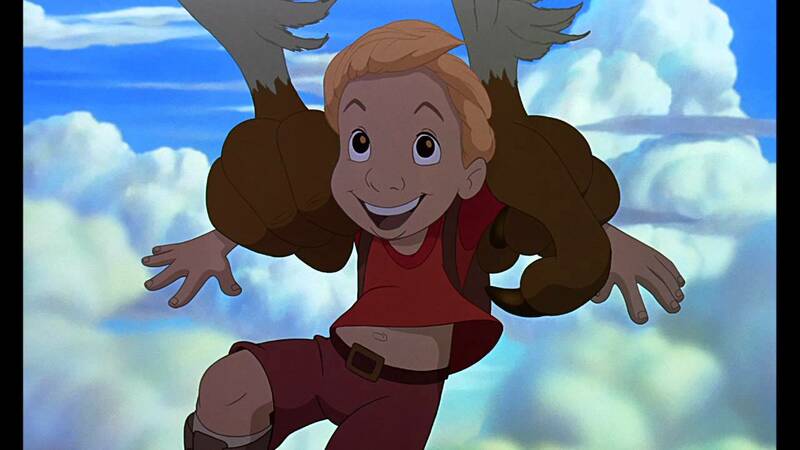 The animation, while maybe not quite matching up to the later Disney Renaissance films, remains colorful and full of detail. This is especially true during the aforementioned musical numbers, which gave a whole new life to Disney features. There are some small instances during close-up shots where the animation isn’t always so consistent, but on the whole Beauty and the Beast is still a lovely film. 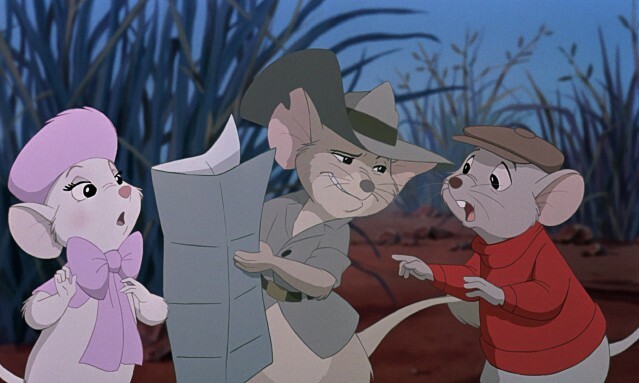 The character designs are still some of Disney’s best. Belle is an appropriate beauty, while the Beast couldn’t look more beastly if he were live-action or rendered through a computer. The supporting cast all boast simple, charming designs, while Gaston is a walking parody of masculinity. The Little Mermaid began the Broadway musical-style of Disney songs and storytelling, but with Beauty and the Beast, Disney perfected their craft. It would remain unmatched in the Disney canon until Frozen was released over two decades later. Beauty and the Beast was, and is, one of Disney’s most entertaining, romantic and magical animated features. The Little Mermaid is one of the most beloved of all Disney movies. Released in 1989, The Little Mermaid breathed new life into the Disney brand, creating the broadway musical-style Disney movies we still see today, as well as kickstarting the Disney Renaissance – a period that saw one Disney hit after another – that continued throughout the 1990s. In terms of pure entertainment value, The Little Mermaid remains a highlight in the Disney canon. In regards to its message and narrative, however, I’m afraid that The Little Mermaid shows a bit of age. We all know the story by this point: the titular Mermaid Ariel (Jodi Benson) is the daughter of King Triton. 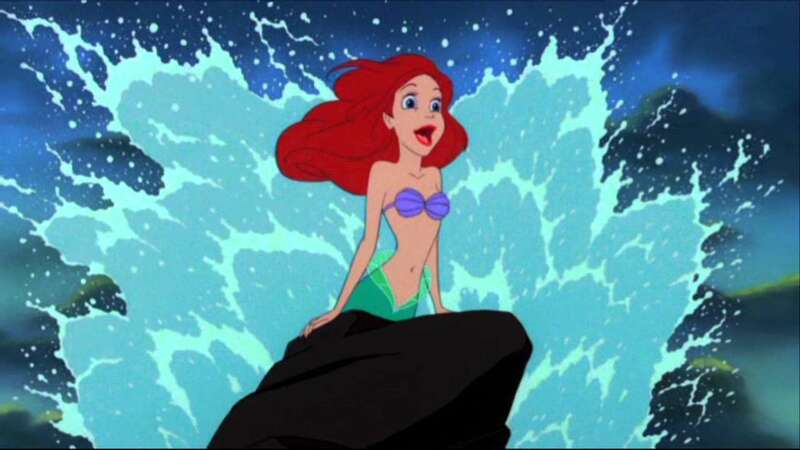 Ariel is too free-spirited and rambunctious to be confined to the sea, she dreams of seeing the world above the waves. She finds the human world to be a more fascinating place, collecting so many human trinkets that she needs a treasure trove to store them all. Ariel ends up saving the life of a human, Prince Eric, and she immediately falls in love with him. The sea witch Ursula (Pat Carrol) has the power to grant Ariel’s wish to live on land with Prince Eric, but at the cost of the mermaid’s beautiful voice. 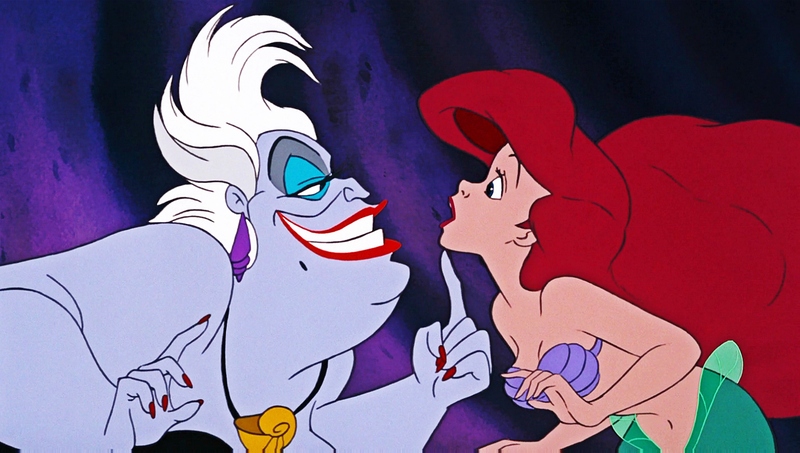 But Ursula has ulterior motives, and plans on using Ariel to get revenge on King Triton. 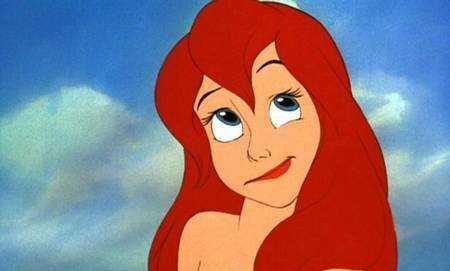 The Little Mermaid features some of Disney’s most memorable characters. Ariel is one of the stronger Disney heroines, showing a sense of ambition and drive that her predecessors such as Snow White never did, and Ursula is one of Disney’s most iconic villains with reason. 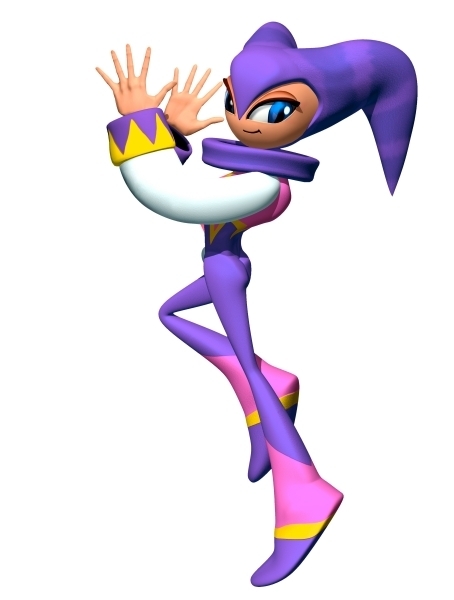 She’s effectively scary and equally charismatic, making her a villain you love to hate. 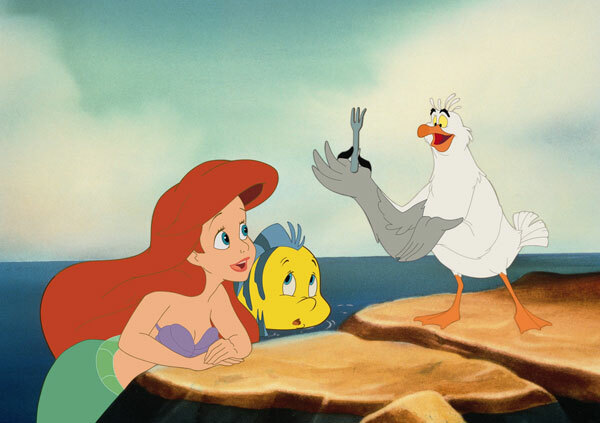 Ariel’s sidekicks include Sebastion, a charming crab who serves as Ariel’s perpetually nervous caretaker, and Flounder, a fish who fills the ‘little buddy’ role better than most. 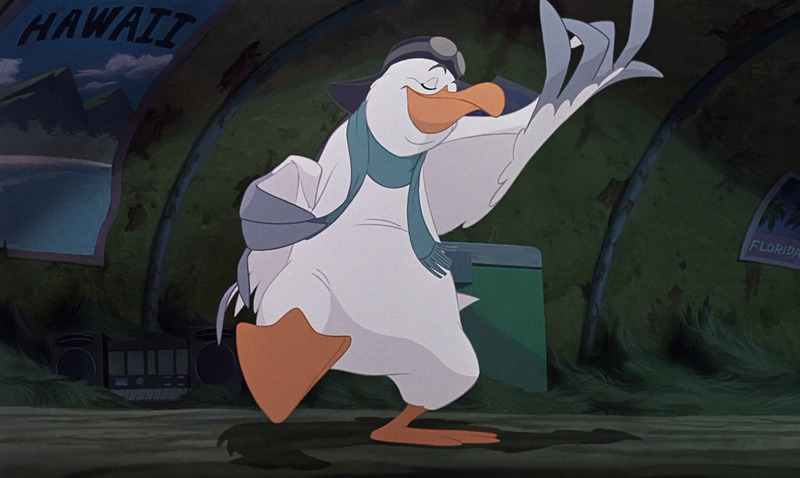 There’s also Scuttle the seagull, who gives Ariel information on her human trinkets with less-than accurate knowledge. The Little Mermaid boasts an appealing cast of characters, but its main stars might just be the musical numbers. Most Disney animated films have songs in them, but The Little Mermaid is one of the few (along the likes of Beauty and the Beast and Frozen) where the songs feel so integral to the narrative that it can truly be labelled a musical. The movie’s centerpiece song, “Part of Your World” remains one of the most beloved of Disney songs, and the Oscar-winning “Under the Sea” is still one of the most fun. While the other featured numbers may not be as iconic, they are nonetheless just as entertaining (Ursula’s musical number “Poor Unfortunate Souls” is an underrated highlight). 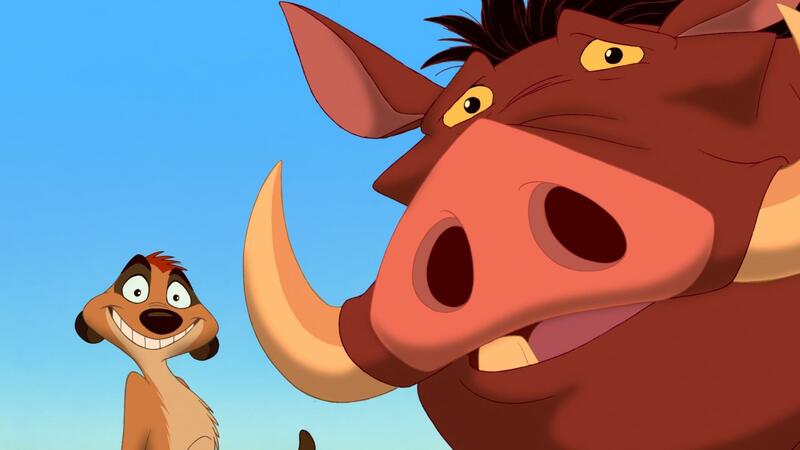 On top of it all, the animation is lively and colorful, and expresses such quality that it’s hard to believe the movie was made during one of Disney’s rougher periods. There were no cut corners in bringing Ariel to life. However, as entertaining as the film still is, there are elements in the story that haven’t aged so gracefully. The major drawback to the film is, strangely enough, Ariel’s infatuation with Prince Eric. As sweet and well meaning as the film is, the love story at the heart of it all feels a bit naive. That is, when it isn’t outright eye-rolling. The problem is that Ariel, who on one hand was Disney’s first attempt to make their female characters interesting, basically falls head over heels (pardon, fins) for Prince Eric based solely on the fact that he’s the most attractive human she encounters. Before he even knows she exists, Ariel is ready to leave behind her life and family just because, well, he’s hot. Sure, Eric ends up being a nice enough guy. In fact, he may be a little too perfect for his (or more accurately, his movie’s) own good. Prince Eric is, unquestionably, the most boring and bland character in the movie. Granted, he never needed to be as interesting as Ariel or as fun as Sebastion, but Eric’s cardboard personality only make Ariel’s infatuation with him seem all the more questionable. The Little Mermaid was supposed to be a sweet and timeless love story, but Ariel’s “love” for Prince Eric more often than not comes off as little more than a juvenile crush. Perhaps The Little Mermaid isn’t the most meaningful Disney movie then. But it still is one of Disney’s most fun offerings. Aside from Prince Eric, the characters are memorable, the animation is lovely and the soundtrack remains one of Disney’s best. Its idea of love may be misguided and outdated, but in terms of sheer entertainment value, The Little Mermaid holds up. Swimmingly.